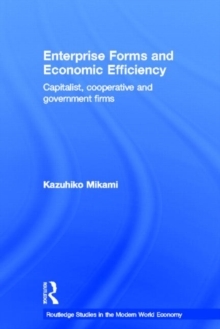 The book conducts a comparative study on the form of enterprise, focusing on broadly defined cooperative firms in comparison with conventional capitalist firms. It explores the essential advantages and disadvantages of the different types of firms and attempts to answer why capitalist firms are so prevalent in our economy. The book attempts to explain these questions from the viewpoint of "market failure" in the framework of standard microeconomic theory. In this analytical framework, it proposes an alternative system of business organization based upon consumer cooperatives and the market for their memberships, which can coexist consistently with the system of capitalist firms and the stock market within a single market economy. The existing studies of the cooperative sector have been rather ideological. The analytical framework that is presented in this book helps promote scientific exploration of cooperative and other types of firms, which are indispensable and potentially promising constituents of our society.